TI Resort Hotel in Las Vegas, Nevada for MGM/Mirage. cheese blintzes and the ruggelah from their European Bakery. After more than seventy years in business, Canter’s Coffee Shop and Deli, one of the oldest restaurants in Southern California, opened a new restaurant at Treasure Island (TI) in Las Vegas. Canter’s first opened in Jersey City in 1917. They moved to Brooklyn Avenue in Los Angeles in 1931, where they introduced 10 cent corned beef and pastrami sandwiches to very receptive Californians. By 1934 they were selling a million dollars worth of corned beef and pastrami sandwiches per year. 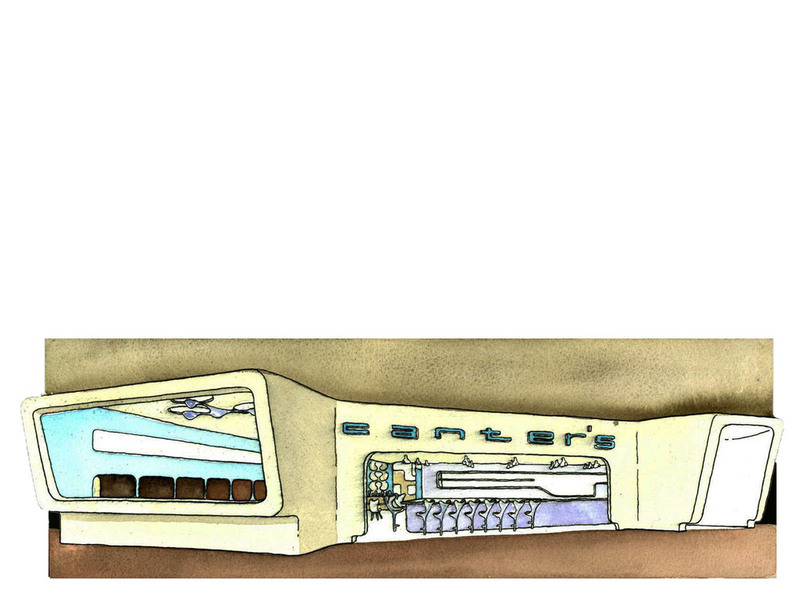 In 1953 Canter’s opened an optimistic post war restaurant on Fairfax Avenue in Los Angeles. The 24 hour a day restaurant became an authentic Hollywood hangout whose regulars included Frank Zappa, The Rolling Stones, Richard Reyfuss, Cindy Crawford, Paul Newman and Jay Leno. The ultra- modernist design incorporated terrazzo floors, stainless steel kitchen counters and cabinets, mod tri-pod pendant lamps, Higgens Rondele sculptures and contoured seats suggestive of California hot rods. Lighting, sculptures and chair frames were hand sculpted in hardwood. Somer were cast in recycled magnesium-aluminum alloy and then hand-polished, others were cast in Kevlar reinforced non-combustible resin. Metal cabinetry and signs for the new logo were cut with computer operated lasers. Mozer Studios employed dozens of American sculptors, artists and artisans to create special one-of-a-kind seating, lighting and sculptures for Canter’s at TI.